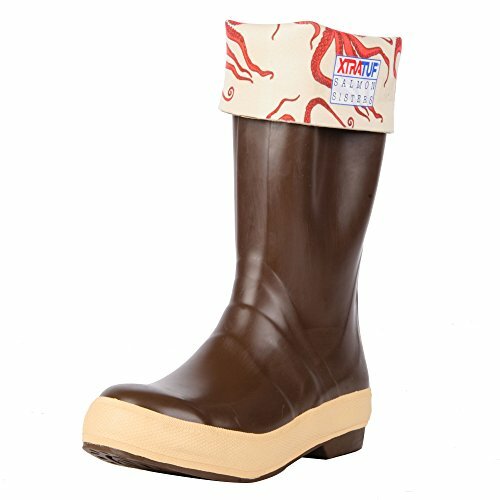 These new XTRATUF Salmon Sisters Legacy Series 15" Neoprene Women’s Fishing Boots feature an attractive octopus-print liner designed by Alaska's famous Salmon Sisters. Inspired by nautical tradition and the sustainable fisheries of the North Pacific, the liner rolls down easily to reveal the eye-catching octopus print. Boasting XTRATUF's signature non-marking Chevron outsole, these women’s fishing boots provide unparalleled traction on slippery, wave-washed decks. Toe and heel guards offer added protection. Designed for all-day comfort, these neoprene fishing boots feature moisture-wicking Breathe-O-Prene insoles with a breathable, open cell structure that reduces insole drying time. The insoles are also cushioned to absorb impacts and combat foot fatigue. The women-specific lasts are designed to match the contour of the female foot, and are narrower at the back to prevent heel movement and chafing. The 100% waterproof triple-dipped neoprene construction is lighter and more pliable than regular rubber, and is resistant to fish fats, acids, diesel fuel and other solvents. If you have any questions about this product by Xtratuf, contact us by completing and submitting the form below. If you are looking for a specif part number, please include it with your message. Bata Shoe 89682-13 Onguard Industries Size 13 Goliath Black Polyblend Chemical Resistant Knee Boots With Power-Lug Outsole, Steel Toe And Removable Insole, 15.34 fl. oz, 1" x 13" x 1"
Bata Shoe 81012-08 Onguard Industries Size 8 White 16'' PVC Knee Boots With Safety-Loc Outsole, Steel Toe And Removable Insole, English, 15.34 fl. oz, Plastic, 16" x 8" x 1"